In this article you will learn about control statements in Java by example. 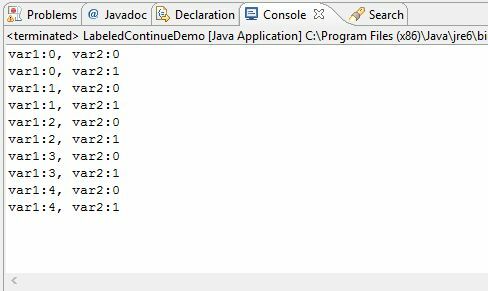 In Java control statements can be divided into the following three categories: Selection Statements, Iteration Statements and Jump Statements. A program executes from top to bottom except when we use control statements, we can control the order of execution of the program, based on logic and values. Selection statements allow you to control the flow of program execution on the basis of the outcome of an expression or state of a variable known during runtime. The first contained statement (that can be a block) of an if statement only executes when the specified condition is true. If the condition is false and there is not else keyword then the first contained statement will be skipped and execution continues with the rest of the program. The condition is an expression that returns a boolean value. In if-else statements, if the specified condition in the if statement is false, then the statemet after the else keyword (that can be a block) will execute. This statement following the else keyword can be another if or if-else statement. Whenever the condition is true, the associated statement will be executed and the remaining conditions will be bypassed. If none of the conditions are true then the else block will execute. The switch statement is a multi-way branch statement. The switch statement of Java is another selection statement that defines multiple paths of execution of a program. It provides a better alternative than a large series of if-else-if statements. An expression must be of a type of byte, short, int or char. Each of the values specified in the case statement must be of a type compatible with the expression. Duplicate case values are not allowed. The break statement is used inside the switch to terminate a statement sequence. 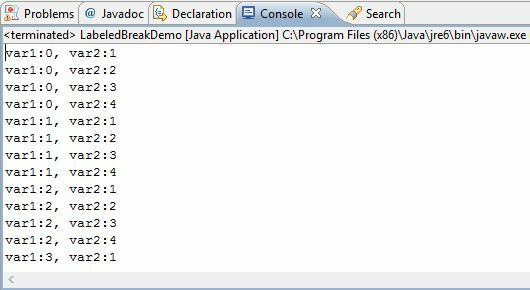 The break statement is optional in the switch statement. Repeating the same code fragment several times until a specified condition is satisfied is called iteration. Iteration statements execute the same set of instructions until a termination condition is met. It continually executes a statement (that is usually be a block) while a condition is true. The condition must return a boolean value. The only difference between a while and a do-while loop is that do-while evaluates its expression at the bottom of the loop instead of the top. The do-while loop executes at least one time then it will check the expression prior to the next iteration. A for loop executes a statement (that is usually a block) as long as the boolean condition evaluates to true. A for loop is a combination of the three elements initialization statement, boolean expression and increment or decrement statement. The initialization block executes first before the loop starts. It is used to initialize the loop variable. The condition statement evaluates every time prior to when the statement (that is usually be a block) executes, if the condition is true then only the statement (that is usually a block) will execute. The increment or decrement statement executes every time after the statement (that is usually a block). This was introduced in Java 5. This loop is basically used to traverse the array or collection elements. Jump statements are used to unconditionally transfer the program control to another part of the program. The break statement immediately quits the current iteration and goes to the first statement following the loop. Another form of break is used in the switch statement. The continue statement is used when you want to continue running the loop with the next iteration and want to skip the rest of the statements of the body for the current iteration. Unlabeled Continue Statement: This statement skips the current iteration of the innermost for, while and do-while loop. Labeled Continue Statement: This statement skips the current iteration of the loop with the specified label. The return statement is used to immediately quit the current method and return to the calling method. It is mandatory to use a return statement for non-void methods to return a value.